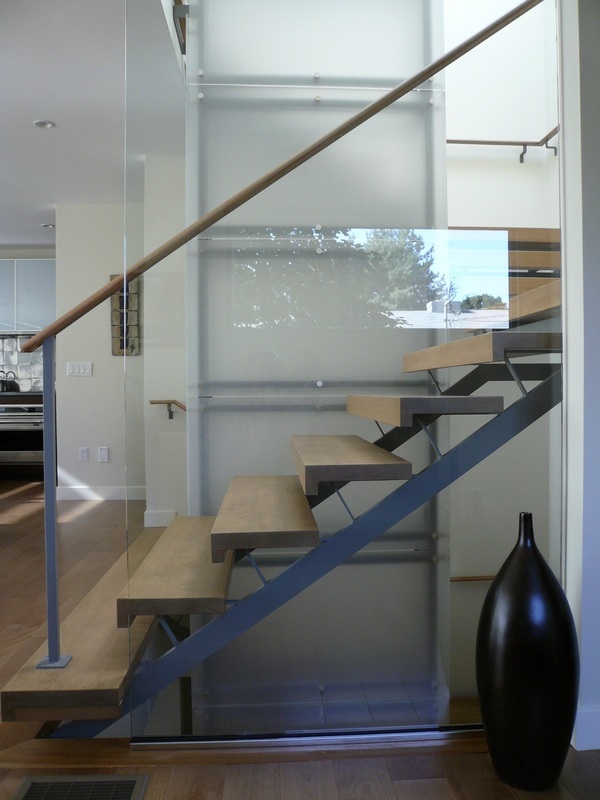 Providence Project - The Design Collective Group, Inc.
"What is the difference between contemporary and modern," the client asked in the first meeting. That was the clearly on the mind of our client and such is the story behind this project. Having worked for the couple on other projects, we knew what they liked but this time they wanted "something different than any thing we've lived in ." So the first question from the client was clear. And before we could get started, we had to agree to what was "contemporary" and what defined "modern" so that we would have an understanding of what they were thinking. For us, It wasn't difficult to answer. 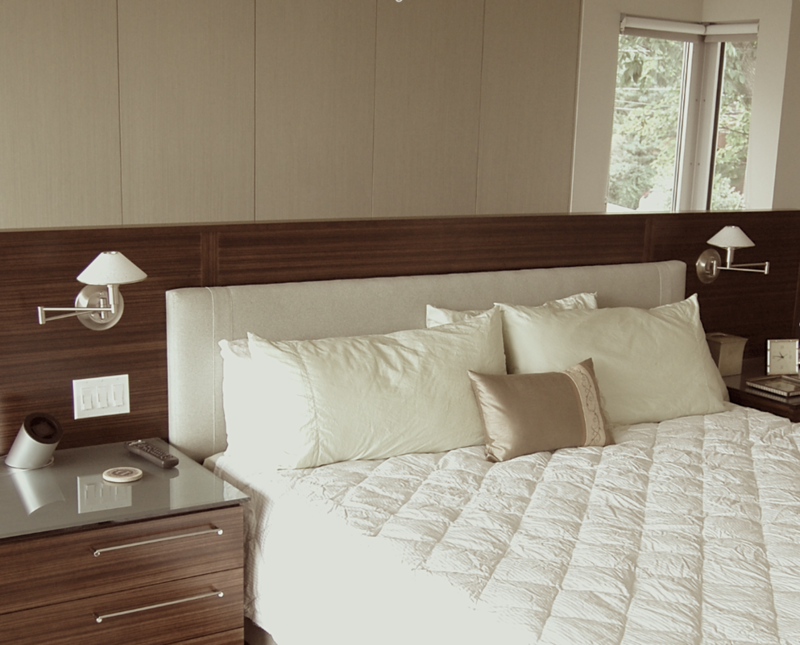 Contemporary design, at least as we define it, is quite simply clean, uncomplicated lines. it is the personification of geometry in form, shape and style. A colleague suggested that "contemporary" is anything that can be designed with a ruler or a compass. We agree. And it is also the application of a reduced number of materials to retain an interior that is at all times understated. Modern is taking contemporary up a level. it is the expansion of clean lines thru stronger geometric forms. It is about the use of unexpected materials such as textured resin as wall dividers or banded extrusions of aluminum that define the structure and move from interior to exterior. And it is very often just about just open space, letting the built environment create the form, establish the shape and set the style. So with a definition on the table, we set about creating the design for this residence that would fall eventually fall somewhere between contemporary and modern. 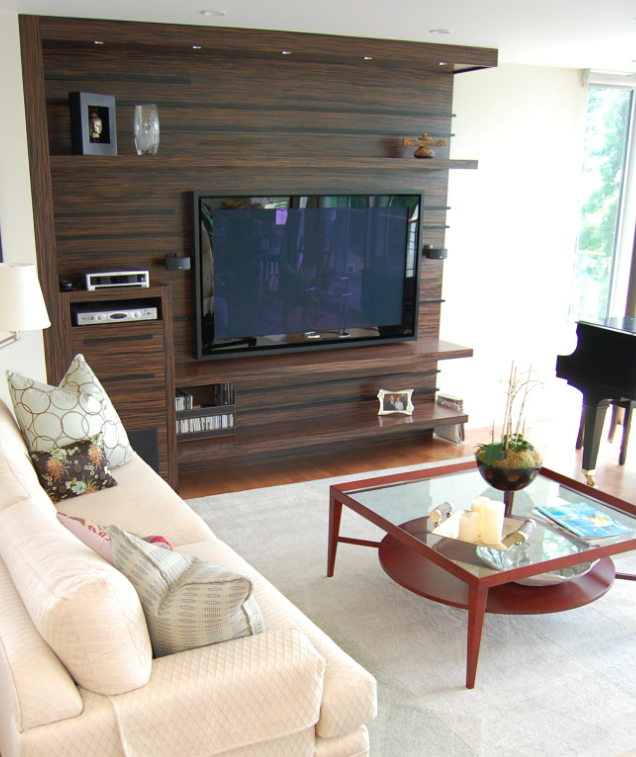 Using "green design" techniques, this wall unit was fabricated from an engineered wood species and finished with environmentally sensitive stains. 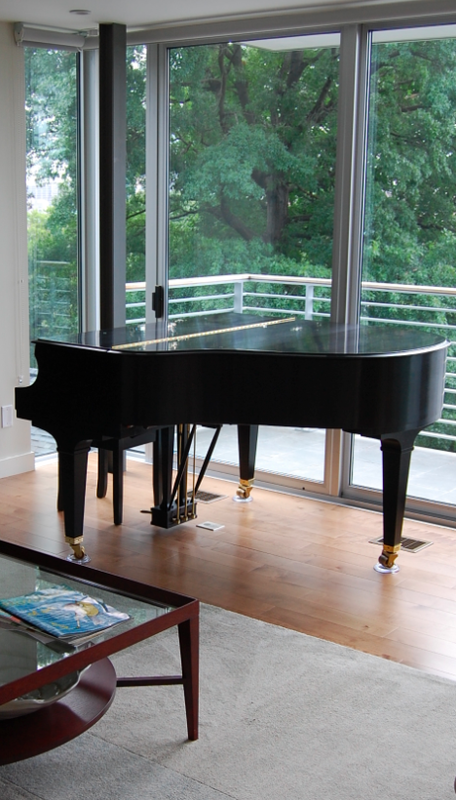 The client's Steinway sits proudly in the corner and has a built-in player that regularly plays Sinatra music thru out the home, that is, when the client isn't practicing for an at-home concert. Working with the client's existing collection of furnishings and an amazing collection of fine art, we blended the pieces into the interior yet kept spaces open and focused towards the exterior and the views of the outdoors. 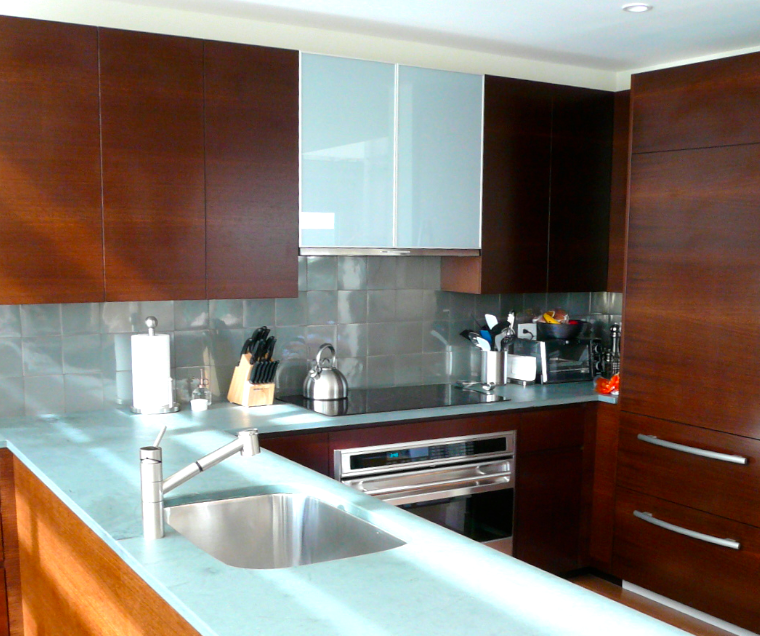 The design of built-in cabinetry retained the open feel of the interior, something we all agreed upon. Window coverings would be minimal yet would need to provide the necessary energy-efficient shading, an important requirement with such large expanses of glass. The back splash tile material is made from recycled aluminum and adds a quiet sparkle to the space. Unlike the previous project we did for the client, this time the requirement was for a small kitchen, one with an open plan "that just worked" as the client enjoys entertaining small groups. The space is intimate yet so functional for the client and looks back to the great room so no one is left out of any conversations. Frosted glass accent panels, honed and sealed soapstone counters and touches of stainless steel hardware compliment each other yet all make for easy cleaning and maintenance. The bed floats in the middle of the master bedroom with loads of cabinetry behind it that provides storage plus an additional dresser. "Her" bath space is a glass enclosed loft, overlooking the dining space but capturing terrific views thru the expanse of the two story wall below. 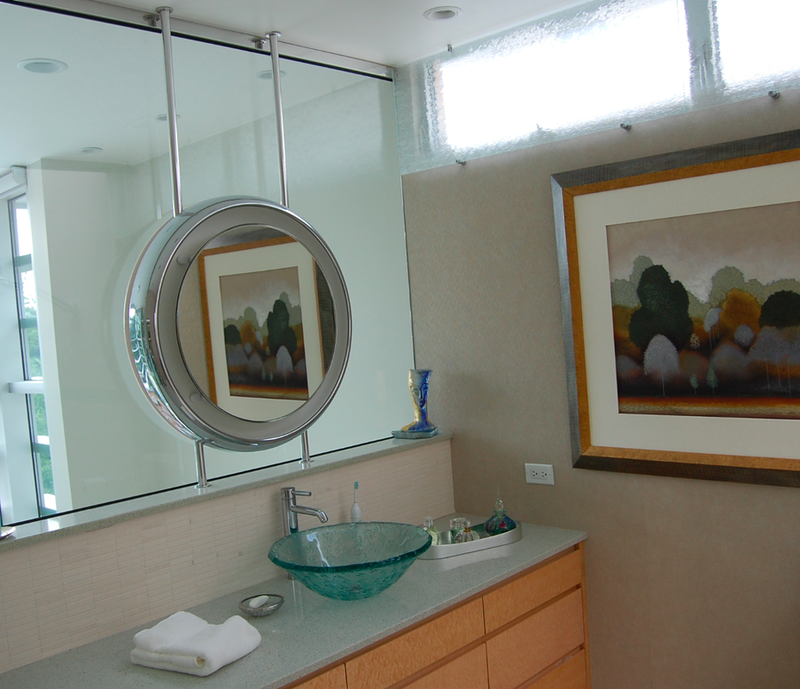 Recycled glass counters, glass vessel sink and an illuminated make-up mirror add a bit of glamor to her own private space. 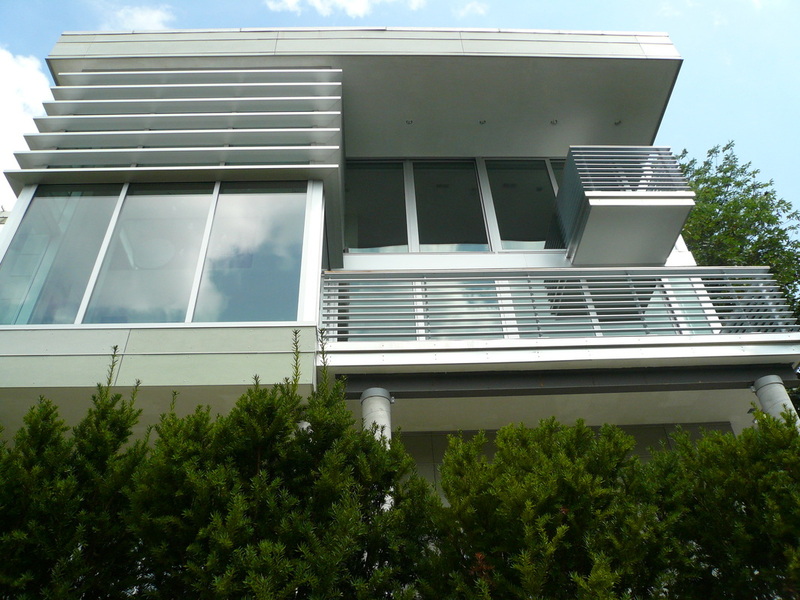 Upon completion of the residence, the client discovered there wasn't much difference between contemporary and modern when furnishings, fixtures and materials are blended so well together. Perhaps it is about perception and one's own definition of style. But we do know that with only 2,100 square feet of interior and spaces that opened into one another, it was necessary to make sure that all the materials were complimentary to one another and cohesive to the eye. Most of the success of this residence wasn't the location nor the architect nor even the contractor. It was the client. A couple who were open and willing to explore and look at things thru the prism of their creative design team. For us and all the others involved who became passionate about their contributions, it proved to be an exciting project and one the client was very proud of. Ash stair treads literally float around the light tunnel in the center core and covered with frosted resin panels distributing light to the center of the home. 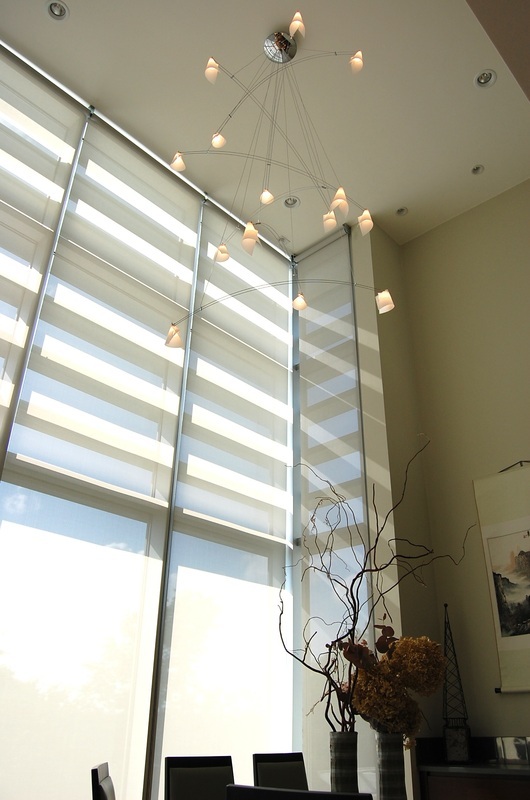 These motorized shades are controlled with some simple technology, opening and closing depending on the amount of heat gain from the sun and the weather outside. Up the stairs to the master suite, the home features a single bedroom space with two master bathrooms, efficient closet and storage areas and a full home office and study. 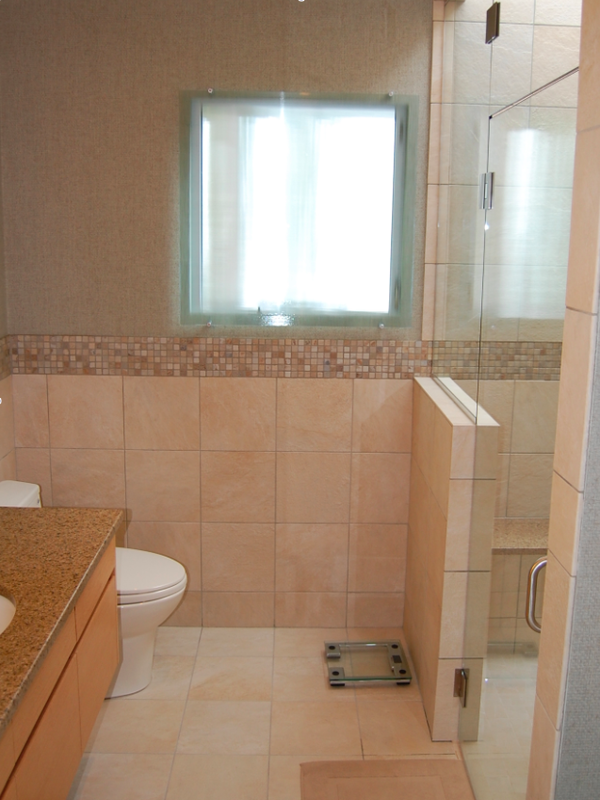 "His" bathroom features a honed granite tile accented with glass mosaic that runs into the accessible shower. The window features a textured glass panel screen installed with stainless brackets providing a bit of privacy yet with lots of light. 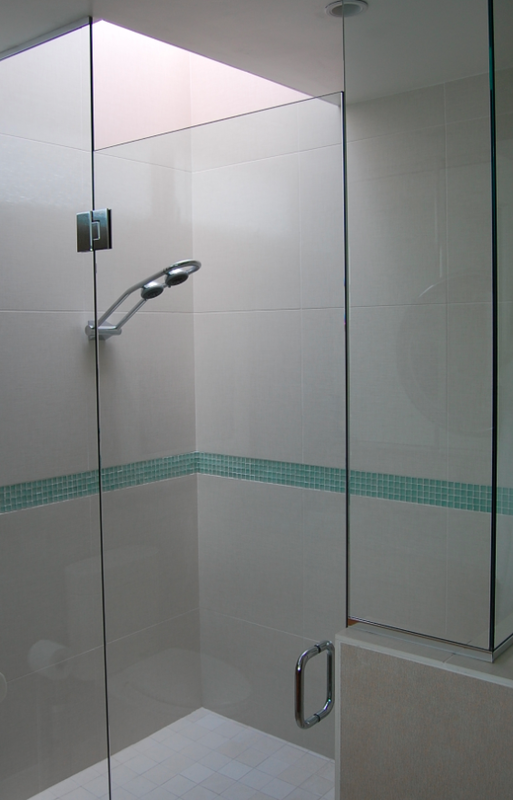 For her shower, we selected a large limestone material for the shower walls with a band of glass to bring in a bit of color. 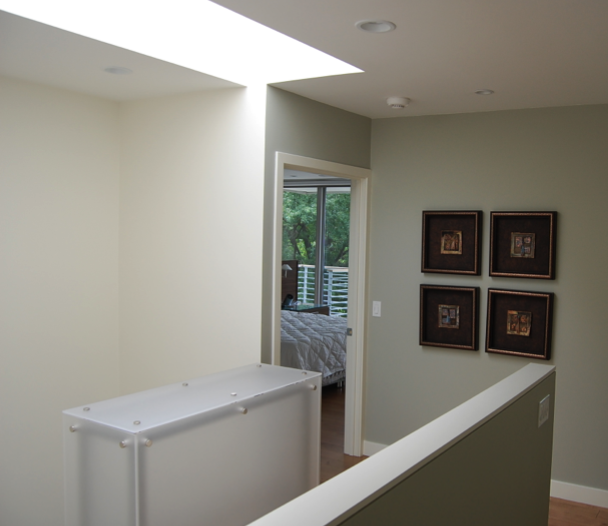 The sky light allows the client to see up and out to nature.
" For us, this house was and is a joy everyday. To put it in terms of music, it was a symphony marrying the organic and functional Frank Lloyd Wright with the concert hall of Frank Gehry. Many thanks to you for this incredible home. "